Nebraska Extension has developed an Excel® spreadsheet titled the “Breeding Cost Cow-Q-Lator.” Photo courtesy of Matt Spangler. A critical component of the cow-calf business is reproduction. Getting cows or heifers pregnant comes with the cost of breeding expense. The fourth largest expense for many cow-calf operations is breeding expense. Consider the following example. A cow – calf producer purchases a yearling bull for $5,000 dollars and plans to use him for four breeding seasons with an average of 25 cows per bull per year. First, let’s take into account costs on the bull side. There is the expense of feeding the bull annually, which is estimated at $500 per year. Annual vet expense for a breeding soundness exam of $75 each year for 3 years needs to be included also. Credit the bull for his salvage value. 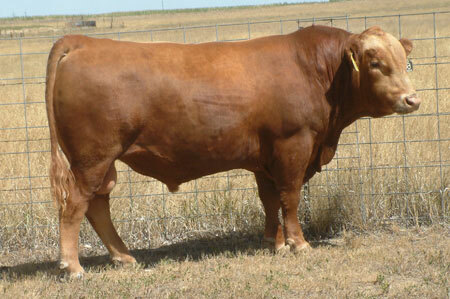 For this example use the purchase price of $5,000 - $1,500 salvage value = $3,500 bull cost. Not every bull has a salvage value. Some die, so include a 2% death loss on an average bull value of $3,000, which is $60 per year. After all of these costs are included, the total cost for using the bull for four breeding seasons is $5,965. Not every cow that is exposed to the bull conceives. At a 92% pregnancy rate, 23 of the 25 cows placed with the bull get pregnant each year, for a total of 92 cows over four years. The total cost of $5,965/92 cows = $65 per cow per year. Purchase price, bull to cow ratio, and years of service are all factors in bull breeding expense. Nebraska Extension has developed an Excel® spreadsheet titled the “Breeding Cost Cow-Q-Lator” that provides a format for calculating breeding expenses. As the spring bull buying season is just around the corner, consider evaluating costs associated with natural service and artificial insemination (AI). The “Breeding Cost Cow-Q-Lator” can be used to calculate breeding costs and allows for comparing natural service to AI. The spreadsheet and a video presentation discussing each spreadsheet segment are available here. Evaluating the price per pregnancy using bulls and then comparing it to estimated cost per pregnancy utilizing AI can be an instructive exercise. As timed insemination protocols have become competitive with artificial insemination on detected heat, more and more producers are considering the option of utilizing AI. This spreadsheet provides a layout in which to compare the options of natural breeding versus AI. As breeding expenses are evaluated, the question that many producers are asking is, “What value is received for the dollars spent?” This spreadsheet can help producers answer that question. Whether you utilize natural service, AI only, or AI with natural service, knowing costs involved with each option and evaluating them against one another can give insight into ways to improve profitability. For additional information related to applied reproductive strategies for beef cattle see the website http://beefrepro.unl.edu.